Hi Guys...well its a beautiful sunny day here in my part of Kent..I hope you have lots of sunshine too...Its time again for ABC Challenge and the letter this week is B for Boo!!... we want to see all your scary creations as Halloween is just around the corner...for my card I used a cute LaLa Land digi image and she is coloured with Prismas Pencils..the papers are Echo Park and I used some of their die cuts for the sentiments..finished with sweet fabric bats..ribbon..and gems...Do pop over to check out my teamies gorgeous creations...and we look forward to seeing all your scary things!!!..lol.. This is such a cute card! 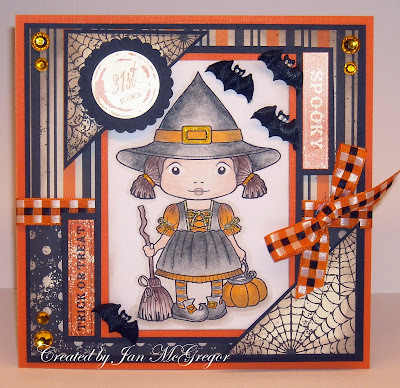 I love the sweet image and the layout you used! Hi Jan! You blessed for the sunny day! Here in north Italy it is a pretty cloudy day... sigh!! !